The planning and hopes for any mod result will depend to some degree on the underlying health of the original amp. Consider these helpful improvements. PA-6 Front-End Circuit Boards for Hafler DH-200/220/500 and XL-280/600. Our new PA-6 raises the bar in every aspect of stunning musical performance. It has new levels of transparency, openness, an unfettered sense of big power, seriously excellent bass power and timbre. Big bass passages are powerful yet defined and very tuneful/taut. The light, delicate touch when appropriate says ‘tubes’. You’ll feel confident challenging any amplifier. The Design: John Hillig, our designer, worked a very long time to achieve enhanced clarity without brightness or ‘etching’ of the upper octaves. Finally he chipped away and a new level of excellence emerged. Design simplicity remains a trademark for Musical Concepts. The PA-6 is an enhanced, effective tweaked-by-ear amplifier circuit with a single-ended differential amp front-end called a LTP(long tail pair). The LTP pair are PNP transistors unlike all our previous boards which used an NPN architecture. A dual transistor circuit relying on transistor Vbe characteristics for reference voltage is used for the current source. This type bias source is also used for the VAS driver stage. It is a completely separate current source which does not rely on the first stage for its reference voltage. 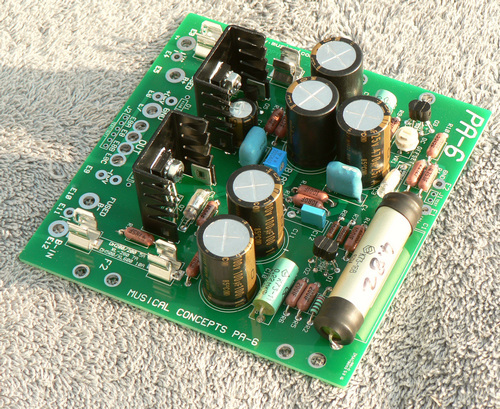 An enhanced front-end power supply design, called CRC, inherited from PA-5 series with four front-end power supply caps provides a much cleaner, quieter voltage for the critical front-end circuitry. Because MOSFETs are very easy to drive a traditional higher current driver is not required so a simpler Class-A transconductance stage can do a great job. We use high-performance low capacitance video transistors. Also since MOSFETS don’t experience ‘thermal runaway’ there is no need for volt-amp limiting circuitry further simplifying the design and enhancing clarity. Your ears will agree that ‘simple is good’. PA-6! What’s important to your listening? NPN VAS driver transistor with low Cob spec > minimal non-harmful load for first stage. Big sound, dynamics. The PA-6 Sound: This is not a mere Hafler, not to demean this great basic amp design! No, this is a great amplifier in a Hafler chassis. You get a sense of a clean, clear response to the most intense transients/crescendos. It has an ‘endless power’ feel to it. The sense of dynamic range, bass solidity and consequent majesty is striking. Overall delicacy is remarkable. The high frequency extension has a lucidity, liquidity and naturalness that makes you think you are listening to a vacuum tube amp. Then along comes bass detail and overall clarity that makes you reconsider. The word fidelity is a really big word. It is more than a marketing term. You feel a connection to the instrument in a way that is striking. Why? Because you are hearing so much more of the true tonal structure and timbral clarity of each instrument. Voices are so clear, full-bodied and intelligible that emotion is conveyed in the performances at a new level. You feel the mood, the intensity of the performer. Many will hear new background vocals singing along with the lead vocal or the multi-layered vocals of the performer simulating background vocals. There is a sense of gut solidity, simple majesty and air-moving power that must be heard. If your speakers play deep you’ll be thrilled. PA-6 modified Hafler amps will easily compare to the finest sounding amplifiers available today. PA-6 Elite has great bass, quick powerful transients, smoothness, natural warmth and great 3D imaging. That same word naturalness just keeps coming up. Though the Elite version does a tremendous job your Ultra ups your game with even better imaging, focus and delicacy. Superb high-end audio grade caps are used in the feedback loop and front-end power supply positions on the PA-6 Elite for higher resolution, crystal-clear frequency extension, clarity and just plain naturalness. See Ultra build details in full mod description below. These kits includes additional installation parts including hookup wire, solder, capacitors, etc. PS-220 Dual-Mono Power Supply(4-10KuF/80 or 100V caps) for Hafler DH-200, DH-220 or XL-280 - Superb PS-220M is an option. See versions here. Call for more options. PS-500 V2B Dual-Mono Power Supply with 4-22,000uF/100V caps for DH-500 or XL-600. Call for more options. You will receive a PS-220/500 power supply specialized for your amp, please specify your amp model when you order. See more PS-220/500 versions here, some of these items on Exotic Parts page. Our latest PA-6 Elite Plus creates a truly a superb amp that demands comparison to any amp available! PA-6 Elite Plus for 200 series amps: $829kit*, $1099.00* installed >>>>>>>For PS-220M version, with Mundorf capacitors, add $150 to either price. PA-6 Elite Plus for DH500/XL600 amps: $879kit*, $1149.00* installed >>>>>>>For PS-220M luxury version, with Mundorf 15,000uF caps, add $100 to either price. *For PA-6 Ultra driver boards add $200 to kit pricing above, $250 installed. This includes gate resistors so please tell us your installation target amp. Our PA-6 Ultra mod is truly State of the Art and beyond State of the Art as it is practiced by so-called high-end manufacturers. Although we at Musical Concepts have modified many expensive well known amplifiers we've never seen build quality even remotely close to the Ultra. The superb Takman resistor is used in nearly all slots for all Ultra driver boards. For all amps the Ultra also includes a new high in-rush current, silver-alloy power switch and a Rhodium-plated IEC power cord socket with hi-current cord. Just imagine what this incomparable product might sell for if it had some fancy over-hyped manufacturers name on the front panel. This is the finest mod we have to offer. Depending on your original amp there are some differences in the power supplies. The DH-200/220 and XL-280 has our TP-202 multi-shielded toroid power transformer. The main power capacitor supply is our PS-220M with IXYS HyperFred rectifiers and four high-resolution premium caps which are the finest you can buy for power supply applications. Jensen caps not currently available - consult with us please. You may want the driver boards only(includes installation parts) so see PA-6 Elite Modification Range, above. We have added the SE version since it has been difficult to source our preferred four-pole Jensen caps. Also kits have been added but it’s a big kit with multiple stages so it is aimed at the accomplished builder. Superb high-end audio grade caps are used in the feedback loop and front-end power supply positions on the PA-5 Elite for higher resolution, crystal-clear frequency extension, clarity and just plain naturalness. PA-5 V2 Elite has great bass, quick powerful transients, smoothness, natural warmth and great 3D imaging. That same word naturalness just keeps coming up. The PA-5 is available only in Elite model range. Some listeners with efficient speakers were concerned about the turn-on thump with the PA-4 Driver boards. With the Pa-5 and PA-6 this is no area of concern with a barely discernable ‘tick’ at the moment of turn-on. PA-5 V2 Elite: $279 kit*, $429.00 installed – you may sub the PA-5 V2 Elite boards into any of the above PA-6 versions at a -$220 reduction. ---------View the installation manual! --------- This is a large file and requires Adobe Acrobat Reader in order to view and/or print it on your computer. Adobe PDF reader is probably already installed on your computer. If not then get Adobe Acrobat Reader here or your choice of PDF reader. See our PS-200/220 page for dual-mono power supply conversions for some amps. It is recommended for all new dual-mono conversions. Improve the transparency, focus, imaging, bass solidity and resolution abilities of your amplifier with the tried and true optimization of your power supply for a mono amplifier level of sonic results. The ability of the amplifier to sound more "together" and unstrained is significantly improved. LX modification techniques include changes in the Feedback Loop, existing RFI input filter, Bias Circuitry, Power Supply, bypassing, compensation caps, etc. The result is a remarkable improvement in perceived wider dynamics, greater naturalness, warmth and transparency! Save yourself from dry, bright sound today! ELITE modification uses all the LX techniques and more. ELITE replaces your main power supply bridge rectifiers, front-end power supply rectifiers(some amps) and important small value electrolytic caps, such as the DC restoring cap in the FB loop. We use the exotic very natural sounding capacitors. Additional power supply bypass caps linearize the highest frequency performance of the power supply. ELITE SOUND - Picture a smooth, extended top-end, wide but perfectly scaled dynamics, tremendous coherency and a fatigue-free listening experience. Picture cymbals with light airy frequency extension and not a bit of harshness. Now picture yourself enjoying instead of analyzing! We don’t service the 9300/9500/9505 amplifier. Hafler LX Modification is $399.00/inst. See our "Connector" page for hi-quality RCA connectors and binding posts that we can install for you!